Basil is a widely used herb that is easy to find in nearly every grocery store and farmer's market. The aromatic plant (Ocimum basilicum) is a member of the mint (Lamiaceae/Labiatae) family and is native to tropical regions throughout Asia and Africa. But many cooks all over the world grow basil at home. 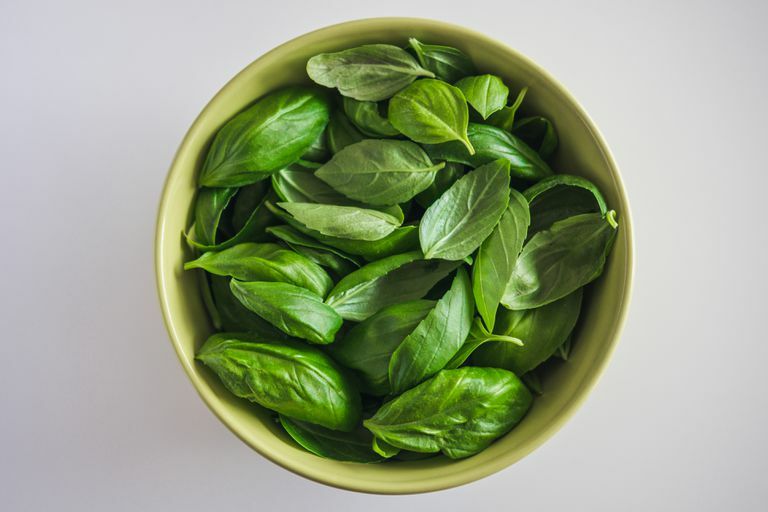 While you might be familiar with basil recipes and easy ways to use basil in cooking, most people are less familiar with the ways in which basil nutrition may boost their health. You've probably added basil to salads and pasta dishes or used it as a garnish on poultry or seafood. But basil is also used by some people to treat certain medical conditions. For example, basil has been used in topical gels to treat acne. In a clinical trial, researchers found that a combination of 5 percent basil essential oil and 3 percent sweet orange essential oil used daily for eight weeks helps clear up the skin. But it is unclear if basil alone can provide this benefit. Additionally, basil is sometimes used in aromatherapy to combat symptoms of fatigue and exhaustion. A small study found that a combination of oils (peppermint, basil, and helichrysum) helped boost the mental alertness of people who described themselves as burned out and tired. Basil may also be used as an appetite stimulant or as a diuretic. Women who are breastfeeding may use it to stimulate lactation and some pregnant women use it before and after childbirth to improve blood circulation. Clinical evidence is lacking to support these uses. There are almost no calories in basil. A single serving of the bright green leaves is about 2 tablespoons chopped. There are less than 2 basil calories per serving when served fresh. Dried basil calories are about the same, but the serving size is smaller (about 1 teaspoon). As you might expect, since there are very few calories in basil, there are also very few grams of carbohydrate, fat, and protein. Almost all of the calories in basil come from carbohydrate, primarily in the form of fiber. There is about 1 gram of carbohydrate in a single serving of dried basil and less than that in a serving of fresh basil. You won't significantly boost your vitamin or mineral intake by consuming basil. However, you'll get a healthy dose of vitamin K and vitamin A, some folate, magnesium, phosphorus, and potassium. When you purchase fresh basil, you'll find it in the produce section of your market. Select a bunch of basil with large, bright, green aromatic leaves that are free from dark spots or flowers. You may also find basil that has roots still attached. The roots can help basil stay fresh longer at home. To store basil, lay the leaves between sheets of paper towel and place inside a plastic bag. Store basil in the refrigerator where it should stay fresh for about four to five days. Dried basil can be stored along with your other spices in a cool dark place. Dried basil will stay good for about two to three years. Using basil is easy. Many dishes lend themselves to the savory, peppery, and somewhat sweet taste of the herb. You can even use basil in beverages. Try a Strawberry Basil Sparkler or simply add basil and a few orange slices to sparkling or flat water. Basil is Generally Recognized as Safe (GRAS) according to the U.S government when used in amounts commonly found in food. According to the Natural Medicines database, the above-ground plant parts of basil are likely safe for adults, children, and pregnant and lactating women when used to flavor food. However, the plant or the oil may be unsafe when the oil of basil is used orally for medicinal reasons for a long period of time because it contains estragole which may be harmful to humans. Basil oil and extract may increase bleeding, slow blood clotting, and possibly make bleeding disorders worse. For this reason, experts recommend that you stop using basil at least two weeks before surgery. Additionally, people who are on blood thinning medications should speak to their healthcare provider before using a basil oil or extract. Lastly, basil extracts may lower blood pressure. If you are on hypertensive medication to lower your blood pressure, you may want to discuss the use of basil oil or extracts with your healthcare provider. Yes. You can flash freeze individual basil leaves on a baking sheet, then place the frozen leaves in a resealable bag for use at a later time. Are there different varieties of basil? There are many different varieties of basil including Thai basil, purple basil, lemon basil, Greek basil, and cardinal basil. The variety that you most commonly see in the market is Genovese basil. Matiz, G., Osorio, M. R., Camacho, F., Atencia, M., and Herazo, J. [Effectiveness of antimicrobial formulations for acne based on orange (Citrus sinensis) and sweet basil (Ocimum basilicum L) essential oils]. Biomedica. 2012;32(1):125-133. DOI: 10.7705/biomedica.v32i1.614. Varney, E. and Buckle, J. Effect of inhaled essential oils on mental exhaustion and moderate burnout: a small pilot study. J Altern.Complement Med. 2013;19(1):69-71. DOI: 10.1089/acm.2012.0089. Natural Medicines Comprehensive Database. Basil. Full Monograph. 08/15/2018.